I think my bump is rather low but I have felt like this throughout the entire pregnancy so I don't think it has dropped yet. With Dylan I could feel his bum up by my ribs but this baby is either smaller or lower down - I am blaming weaker stomach and pelvic floor muscles! I do feel big, but not too big and I appear to be measuring about right or only slightly over for dates now so I remain optimistic that the little one will fit into newborn clothes when he arrives. The midwife is happy with his size and growth and I have another appointment in two weeks - much more frequent than in my first pregnancy! Movements have definitely changed and I don't get so many kicks now. What seems to happen is he does twists and turns which completely distort my belly and you see it moving around like there is a party going on in there! He is definitely running out of space though and I can always feel the outline of his body where my tummy is hardest. I think the tiredness may be beginning to kick in this week as I have been practically falling asleep as I play with Dylan some days. I do find that if I am out all day or have people over that I seem to have more energy but sitting on the living room floor all I want to do is lie down and have a snooze! My back is not suffering like it did in the first pregnancy but I do get some groin aches, especially on the odd occasion I sit down for more than ten minutes and then try and get up again. Still no cravings, nausea or heartburn and I am hoping I have been lucky enough to get away without any of the awkward symptoms yet again! I am still managing to sleep through the night with no insomnia or toilet trips and hoping this continues! I don't really feel like pregnancy is restricting me yet and am still crawling around on the floor playing trains and dinosaurs like I did before I got so big. I have lots of plans for the last few weeks of pregnancy including numerous trips to London so taking it easy is certainly not an option. I am not on maternity leave until 2 days before my due date as well so really pushing my luck! Although we still are nowhere near ready for the little guy to arrive, I do now have all the essentials for the first few days and I am happier knowing that they are sorted. I have bought some newborn nappies and the dreadful but all too necessary maternity pads. We have some tiny newborn clothes and today my gorgeous new Moses basket from Shnuggle arrived. It is so white and beautiful and has really got me excited about the impending arrival! I already know exactly where it is going to go and I will write a full review once the little man is here and sleeping peacefully in it, but until then you can admire how prepared I am and forget about the fact Squish's room is still full of boxes that have to be unpacked before we can carpet and paint his nursery! Too quickly for my liking! Beautiful photo. Not too long to go, so exciting! Looking great and the moses basket looks lovely. It really does - excited about trying it out properly soon! Come and check out my MAC Eyeshadow Giveaway! Tiredness is definitely worse than first pregnancy but am not napping in the day . . .yet. 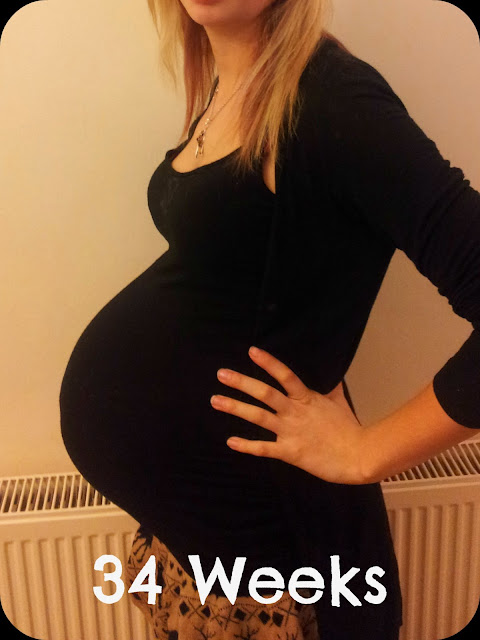 36 weeks update may say differently!